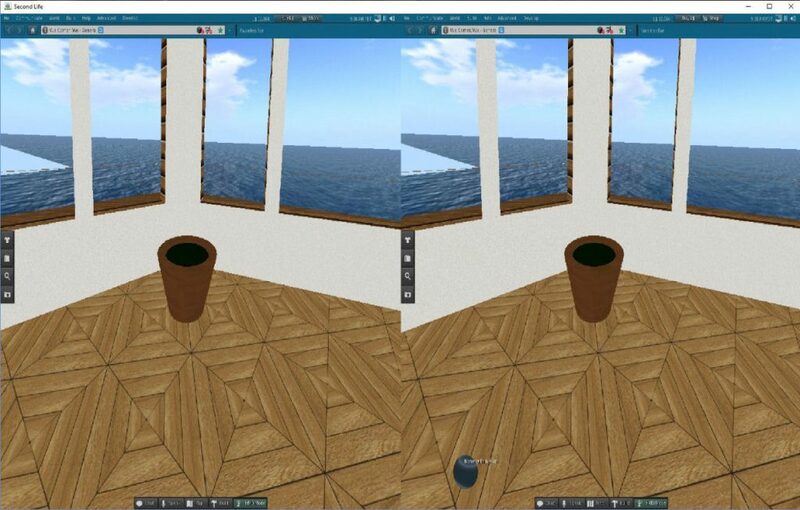 On 1st July 2016 Linden Lab released a first version of their Oculus Rift Viewer version 4.1.0.313313 which is meant to work with the newer Oculus runtime 1.3 and hence to support the CV1 consumer version of the Oculus Rift. The previous version of the Second Life Oculus Rift project viewer version 3.7.18.295296 was only for for the Oculus development kit versions (DK1 and DK2) and has been reported on in previous blog posts. It was working quite well with those earlier versions, most UI issues had been addressed, and it was perfectly usable. See e.g. this blog post for a report on using an early build test version to provide feedback just before that release, and all the issues outstanding were dealt with by the time the user release was made. On first starting up the new release my impression was that I had the wrong installer. So much is not working or wrong. Feedback is being provided to Linden Labs by others as so much seems incorrect. 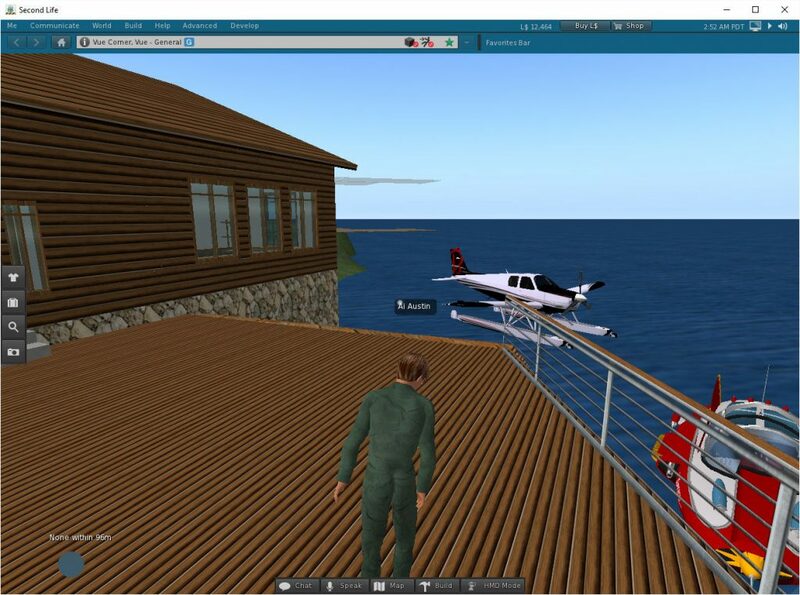 Reporting individual issues via the Second Life JIRA does not yet seem to be the appropriate route until the fundamental problems are established. To provide the images illustrating issues in one place I am making this blog post in the interest of rapidly getting the problems fixed. My rigs are Dell Precision towers with Windows 10, Xeon processors, 32GB memory, SSD drives, Nvidia GTX980 GPUs. One has an Oculus DK2 and the other an Oculus CV1. Oculus Home is the current version 1.5.0.240083 (1.5.0.241049). Nvidia driver is the latest version 368.39 (7-Jun-2016). Windows 10 is on latest release and fully updated. There is a security certificate issue with the download itself. The release notes at http://wiki.secondlife.com/wiki/Release_Notes/Second_Life_Project_OculusRift/4.1.0.317313 seem to not have been fully checked. They mention in Windows Display settings to “adjust the refresh rate on the DK2 to 60hz rather than 75hz”. That refers to an earlier setup where the DK2 could be an extended display showing in the Windows Display settings. The Oculus no longer shows in Windows Display settings. The release notes also still refer to “turning low persistence mode on and off” but this settings no longer appears in “Settings” -> “Move & View” -> “Head Mounted Display”. I always add the “HMD Mode” button available in the Rift project Viewer to my viewer user interface to make switching back and forth easier than using the keystroke equivalent (Ctrl+Shift+D). In all cases and with all graphics settings I have tried, on both DK2 and CV1 setups, the HMD view is over bright and washed out pastel in colour. This is in the HMD itself rather than the on screen 2D monitor split screen images I will present below, which are normal colour. A “Pixel Luminance Overdrive” setting existed in the previous release which is now no longer present in settings might be worth checking. But just this alone means its odd this release got through basic testing. With the default setup after install, it seemed that many objects were missing. See the scene illustrated in the 2D monitor view shown in the left hand image and the HMD view on the right. This turned out to be ALL objects with transparency or partial transparency, whether in the scene (such as the hot tub water) or worn in attachments on the avatar (like some elements of hair). 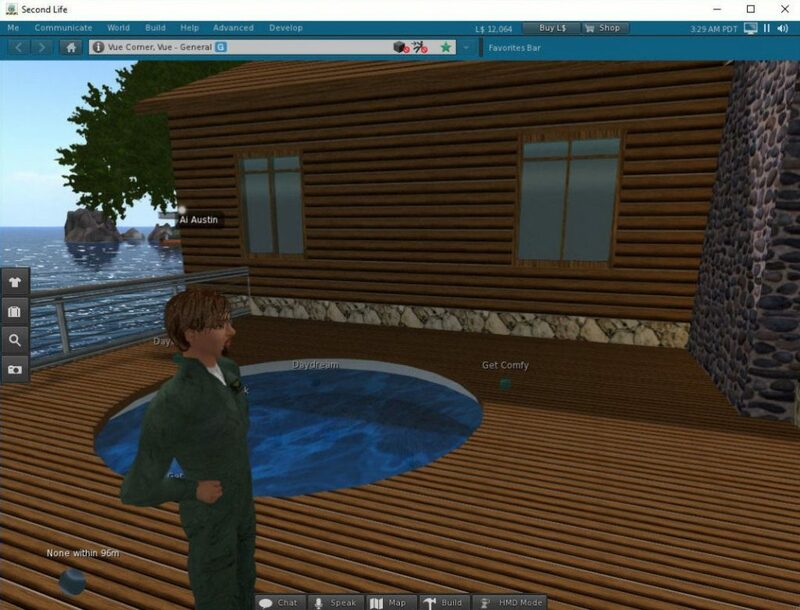 The hot tub water is a missing partially transparent object by the way, not the usual sea level “Linden Water”. The right hand HMD Mode image shows BOTH a sea patch drop out issue (to top left corner of image and described more fully below) and the missing transparent object issue. After some experimentation turning off “Atmospheric Shaders” fixed this. In later experiments, I also get it to work (even though for the same low res and bright view) with Advanced Lighting on and Atmospheric Shaders off, at say the “Medium” graphics setting. In fact if I select the “Medium” graphics settings and then using Advanced Settings turn any ONE of Advanced Lighting or Atmospheric Shaders on the transparent objects show. But having BOTH on they do not show at all. Particles do work fine, so long as you have turned off one of “Atmospheric Shaders” or “Advanced Lighting”. When set to “Low” graphics in HMD mode I just get solid red in the left eye and solid blue in the right eye, no 3D objects at all. The quality of the image in the HMD is very low indeed, and much worse than the previous release. Its unusable as it stands. Changing graphics settings appears to have no effect on this. 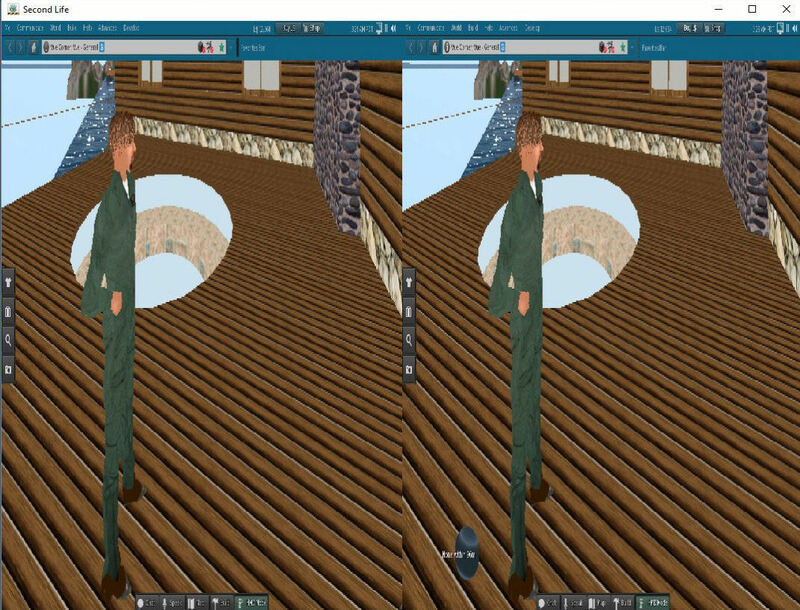 Depending on the size of your 2D Second Life window before you enter HMD mode, the main Second Life menu bar appears in a fixed position, flat and not all visible. With a small initial window it appeared right across the middle of the HMD view. With a full screen 3D view before entering HMD Mode it appears very might up in the field of view. Changes in “Settings” -> “Move & View” -> “Head Mounted Display” appears to have no effect on the UI elements in HMD mode at all. This is the case even after save, entering and leaving HMD mode or even after restarting the viewer. Most UI elements did not show in the field of view in the HMD. Buttons to left, bottom and right were far out of the field of view, as were HUD elements in the lower left and right. In the HMD Mode, all (? )objects and avatar labels appear to be missing, whether or not the UI is toggled on or off (Ctrl+Shift+U). This would make normal meetings and interactions impossible. The mouse cursor does not show when in the HMD Mode. It can be seen on the 3D monitor split screen view when in HMD Mode, but not in the HMD itself. 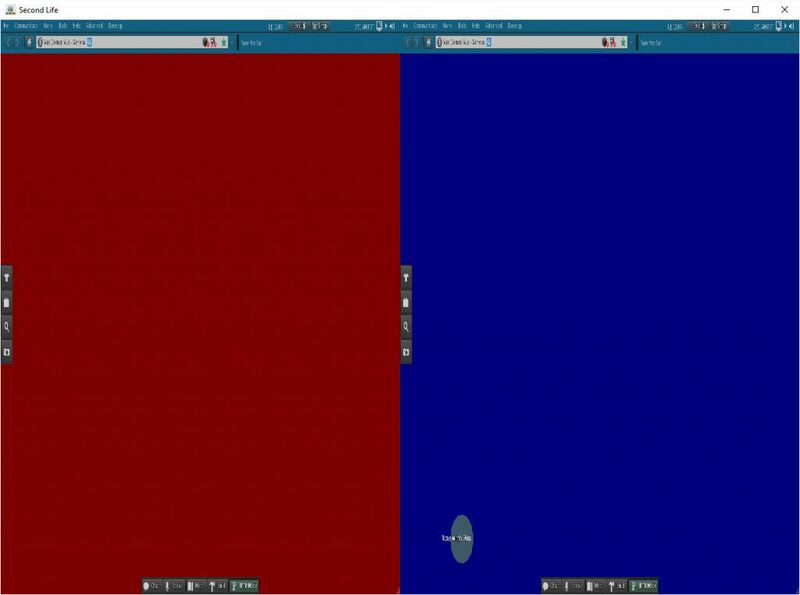 The mouse however even when trying to use it on the 2D split screens is not operating anywhere near where the pointer appears, so far way objects are selected when hovering over seats for example. None of the object right click menus therefore work correctly, and no object interaction icons appear to work. There are strange rotations of the camera if you enter and leave UI show/hide with Ctrl+Shift+U. But this key combination only affects the 2D split screen view and not the view in the actual HMD, and does not remove the blue main menu which can be right across the main view. Icons that should show when hovering over suitably set objects, such as the Sit icon for seats do not show in the HMD Mode in the HMD itself or even on the 2D monitor split screen view. In the HMD view, one or more sea patches (for whole regions) show as light blue rather than the correct water surface. These used to occur in the main viewer with Object Occlusion set on, but was recently fixed. It may just be a bad case of the same “Z fighting” issue reappearing given the low resolution of the HMD image. 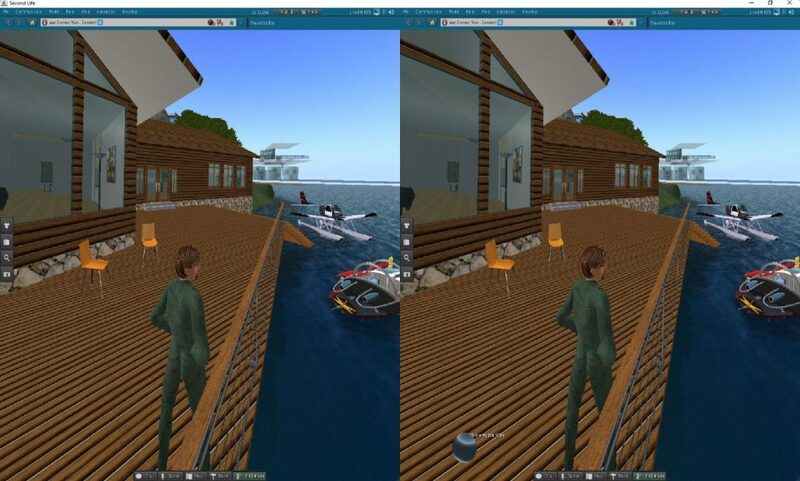 This issue occurs with the Atmospheric Shaders on (left hand image) and with Atmospheric Shaders off (as in the right hand image where the closer up patch is a darker blue, but a far off region near the horizon also shows as light blue). Click on the smaller thumbnail images to see the full resolution versiosn to illustrate this more clearly. 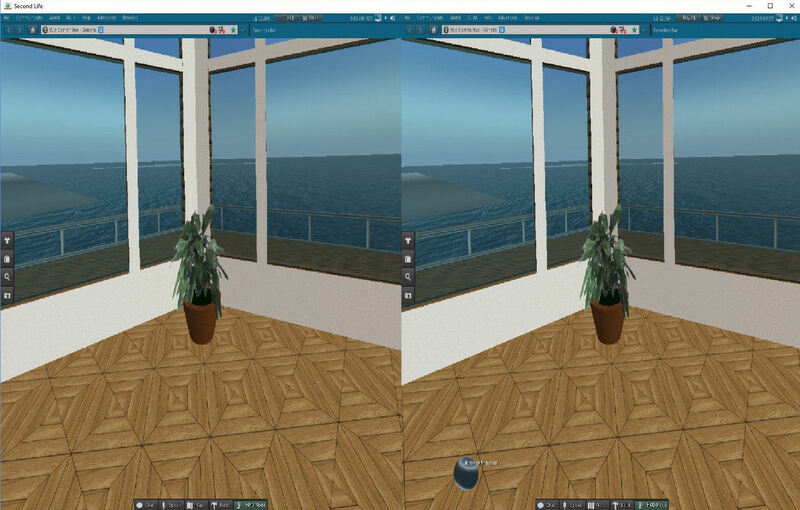 Both these HMD mode images illustrate the sea for adjacent and sometimes also further away regions showing as light or dark blue patches rather than the proper sea surface. Objects (or parts of linked objects) near the edge of the field of view in HMD mode disappear before they are out of the actual view. If you move your head to a specific angle they can even flash very fast. 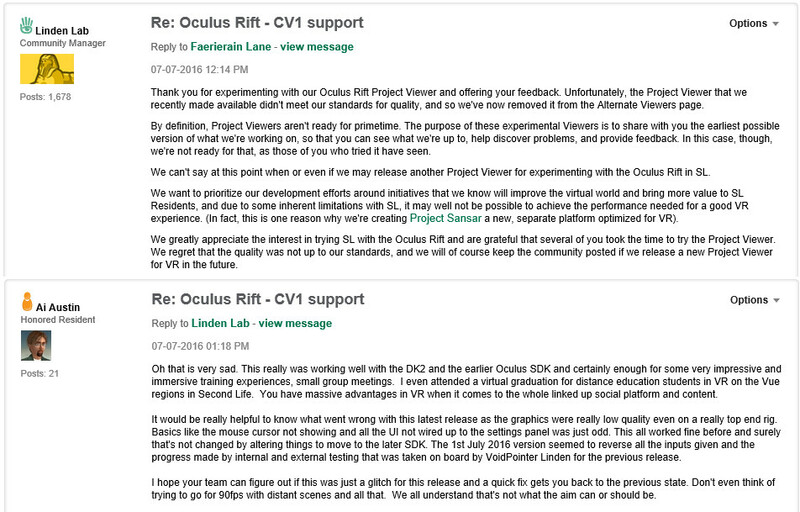 When in HMD mode, the viewer maintains the two view split screen 2D monitor mirror of older Oculus Rift setups. Oculus SDK 1.3 provides a single more usable screen which is more helpful for some types of user interaction with the 2D view, chat tools and when interacting via the mouse or keyboard as is necessary in Second Life. Some testers have indicated they are not seeing 3D VR in the HMD at all. There may be some confusion if you have not got past the stage where Oculus Home is running (normally launched when you first enter the viewer, remembering that for the DK2 that must be switched on before you run the viewer) and where you have accepted the health warning. You may get a message saying that the viewer is not communicating as its waiting for the first time you enter HMD Mode. After all that you should see 3D/VR in the HMD, and I certainly see 3D/VR properly on my DK2 and CV1 rigs. Note that a giant 2D screen wall of the normal 2D monitor view appears in the HMD when you are NOT in HMD Mode. Possibly only after you have been in HMD mode once (to sync properly with Oculus Home as described above). But you must be in HMD mode for proper 3D/VR. All issues occur on both the DK2 and CV1. But there is an additional problem in the CV1 in that the UI layer and the 2D cinema screen view when not in HMD mode appears to be flipped or reverse between the two eyes, so its difficult to focus on in the CV1 unless you close one eye. Clearly something has gone wrong with this release, or some basic settings need switching to make the release work as expected. These notes are provided in the hope the fixes can quickly be identified and a replacement release provided to let us get back into Second Life in VR. We want to prioritize our development efforts around initiatives that we know will improve the virtual world and bring more value to SL Residents, and due to some inherent limitations with SL, it may well not be possible to achieve the performance needed for a good VR experience. (In fact, this is one reason why we’re creating Project Sansar a new, separate platform optimized for VR). This entry was posted in Oculus, Second Life and tagged CV1, DK2, Oculus, Rift, Second Life. Bookmark the permalink. You did an incredible job documenting the issues with the lastest Oculus Rift Viewer, Do whatever it takes to make sure they see this because you nailed it. Makes me kinda wish you was there to personally oversee the development of the viewer. 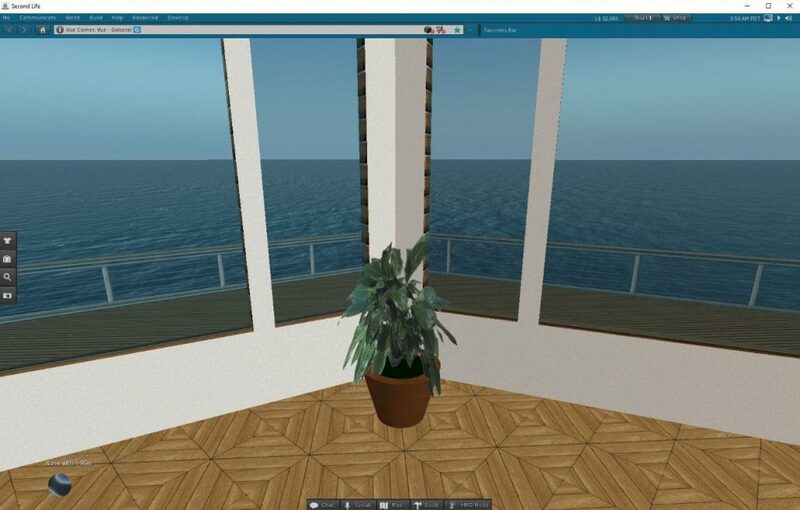 I have always been happy to test and give feedback on the Rift viewer as I think Second Life has much of what I hope to see in a future VW/Virtual World arena. Other platforms I am trying, even if designed from the bottom up for VR, just have so far to go to become as useful. 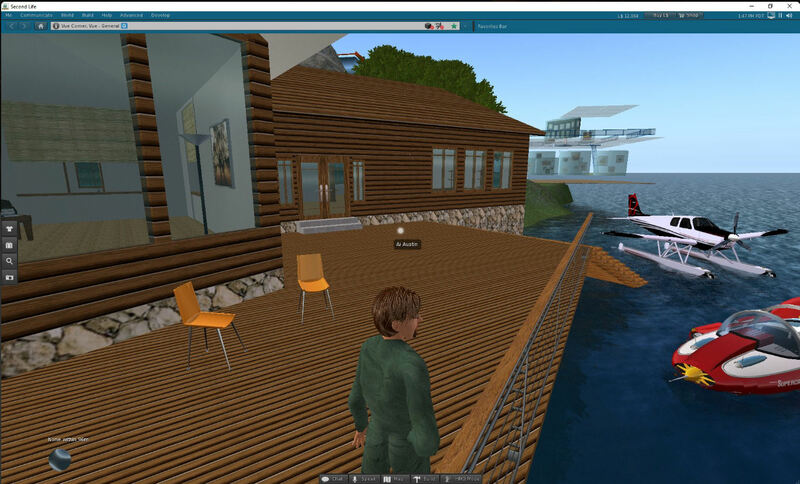 And I like the connected community in a single large persistent shared virtual space however that is achieved. Lets hope there is some simple fix to return the viewer to at least the state it was in before but working with the latest Oculus runtime, and then take it from there. I’m having a problem with my screen being split 50% up and down rather than 50% left eye and right eye… so I get half of my left eye being totally black… the top bar of the UI is in the middle of my screen in the headset….how can I fix this? I have an alienware x51 oculus ready pc and cv1…. any ideas? Sorry, no ideas to help. The vertical split HMD view is not an experience with my CV1. I do see the menu bar smack across the centre of my HMD view with a smaller 2D window before entering HMD Mode, and its not adjustable with any of the settings. But this release has so many problems I think we need to wait for the basics to be addressed before then giving what I hope is more precise feedback to Linden Labs on any remaining issues. Jo Yardley’s Second Life Blog Post with news of the withdrawal of the Second Life Oculus Rift Viewer 4.1.0.313313 and possible bad news that no replacement may be forthcoming from Linden Lab. From the descriptions of the rendering problems people have encountered with the LL Rift viewer, to me it seems like the image data is not successfully making its way through all the stages and branches of the graphics pipeline. Plus the culling frustum not being quite right.